Among the green hills of Kegalle, about 50 miles (85km) from Colombo on the road to Kandy in the hill country, a herd of about 60 elephants live in the Pinnewela Elephant Orphanage. This popular attraction, established as a sanctuary covering 25 acres of lush forest by the Sri Lankan Government in 1975, is unique. 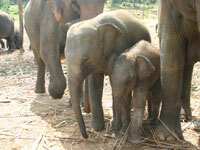 Its purpose is to feed, nurse and house young elephants lost or abandoned by their mothers. Recently the sanctuary has also started a breeding programme. Visitors are invited to observe and assist the baby elephants as they are fed from giant feeding bottles, before the pachyderms are lead down to the river for their daily baths at 10am and 2pm. Although extra money can be paid to ride, swim with and feed the elephants the main attraction for many people is simply watching them at play with each other in the river from the banks. The sanctuary has received both praise and censure from animal rights groups, for various reasons, and although most tourists rave about the attraction, some visitors complain that the animals don't have more freedom. The admission costs go entirely towards maintenance of the sanctuary and feeding the animals and most reports conclude that the elephants are well cared for - they certainly seem happy as they cavort in the river!